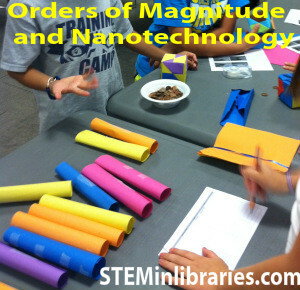 Play a game to understand and calculate the Orders of Magnitude, then use paper shapes to mimic structures on the nanoscale. -Print out 2 sets of Sizing Things Down cards in color on card stock. Shuffle each deck thoroughly and keep separate. -Make models of the paper tube and paper cube for the nanotechnology project. -Separate pennies into bowls for each group–250 pennies per bowl. -Prepare 1 weight holder for each group, per the instructions on Science Buddies. 2. Explain what nanotechnology is, the nanoscale, carbon molecules at the nanoscale, uses of nanotechnology, and just how small a nanometer is: 5 minutes. Optional: Show this video from RMIT University: How Does Nanotechnology Work? There are multiple fantastic sources that can teach you the basics of nanotechnology. Explain That Stuff’s article on nanotechnology is a good general primer, as are these from MRSEC Education Group, and Nanooze.org. Science Buddies has an excellent breakdown of the nanoscale and the ways carbon is formed (which is the basis for their Exploring Nanotechnology project). Insofar as explaining the Orders of Magnitude, we found the explanation on this Word document from NISE extremely helpful. You may also want to check out definitions from TechTarget.com, FSU.edu, Boundless.com, and Math is Fun. We did explain multiplication (10x10x10) to understand the Orders of Magnitude, but in order to find the difference between orders on the scale, we simply wrote out a number line (e.g. -4 -3 -2 -1 0 +1 +2 +3) and had them count the places between the two orders of magnitude. 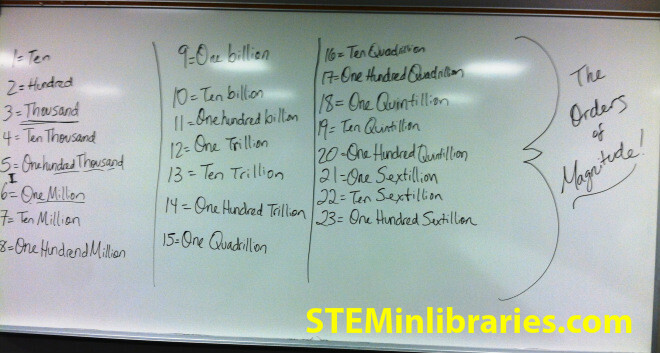 So, if one object was 10(-3) and the other object was 10(1), we counted out 4 places between them. Then we looked at our chart (in the picture above) to see that 4 orders of magnitude means that the objects are 10,000x bigger/smaller than each other. See the picture below for an example. Believe it or not, our kids were totally into this activity. 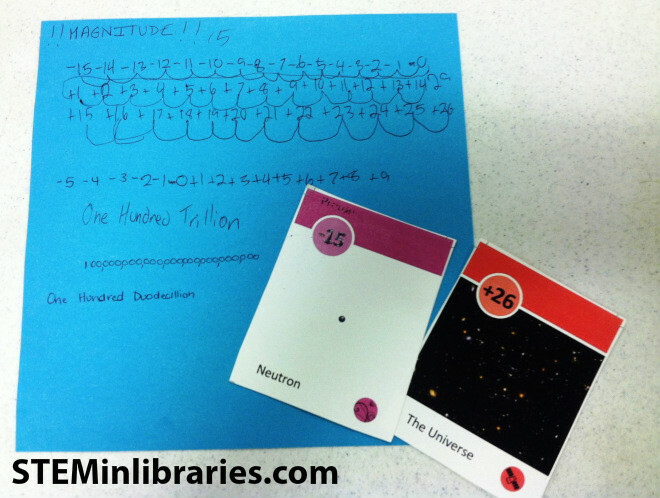 Prepare yourself for the eventuality of them wanting to calculate the orders of magnitude between the biggest and smallest cards. When that happens, you can find the name on Wikipedia (or, if you can’t bear using Wikipedia in a library, you can try this site from the University of North Carolina instead). 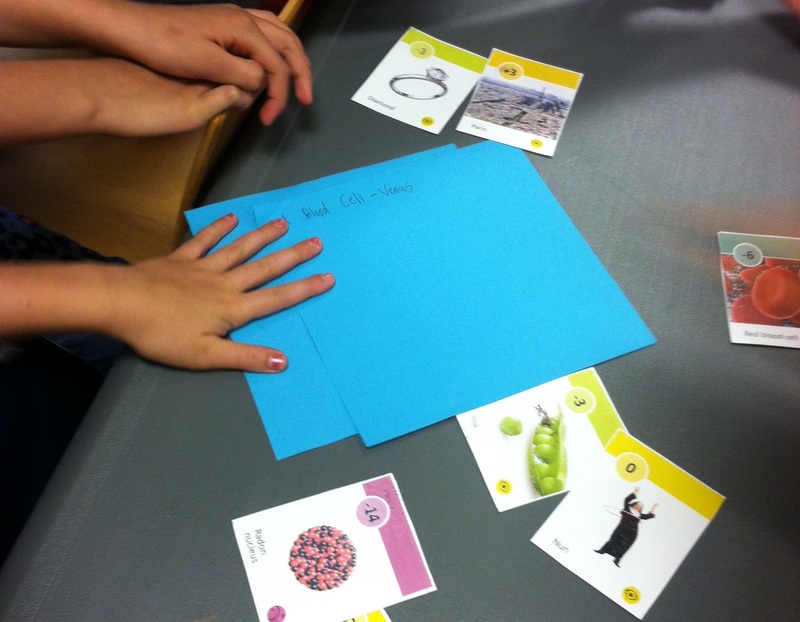 The Exploring Nanotechnology project came entirely from Science Buddies. Please visit their website for excellent instructions! We split the participants into 6 groups of 4 for this project. We set up tables in a closed rectangle with an open center, seating the participants around the outside of the rectangle. The tables had just a small gap between them for testing the paper objects per the Exploring Nanotechnology project procedures. This allowed sufficient testing areas for each group. YouTube: How Does Nanotechnology Work? YouTube: How Small is Nano? TechTarget.com: What is Order of Magnitude? 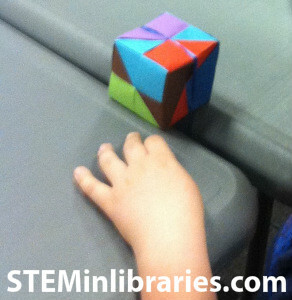 It would’ve been helpful to demonstrate how to make one of the pieces of the paper cube, as well as how to attach the pieces to form the cube. Depending on how many kids there are, it might be best to have 2-3 people demonstrate this to groups of children simultaneously. This is not recommended for a younger audience. However, this program would still work very well for middle school (and possibly high school) students as-is.